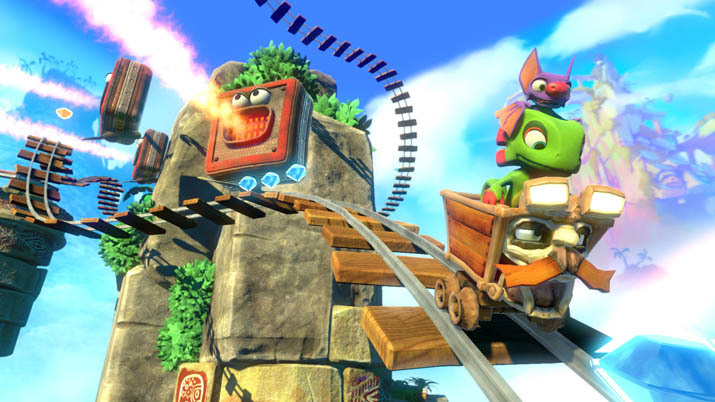 Yooka-Laylee is a wacky 3D-platformer and the spiritual successor to Banjo-Kazooie, after nineteen long years. You first see a cut scene of the Hivory Tower, the naming of which, along with the rest of the script, is a bit comical, as the characters recognize they're in Yooka-Laylee — I always enjoyed how the Banjo series had a proclivity for breaking the fourth wall. You can also find references to other releases: a blue, shovel-holding knight, for example. after he appeared, though, I had to turn down the sound effects, as the voicing was a distracting guttural cacophony, as if I were hearing someone button mashing discordant chords on the keyboard. It recalls the days of Banjo-Kazooie; fans of the predecessors will easily recognize this dialogue style and may feel a sense of nostalgia. The quality of graphics does seem to improve across settings, but, at the highest setting (“Fantastic”), I still saw rocks whose edges were blurred and had some weird vertical grid patterning occur, as if the texture hadn't rendered correctly. If you find yourself beginning to feel uneasy or dizzy, take a rest; it is a bit unfortunate to have to limit a session, but sometimes it may be necessary. Perhaps I merely consumed a toxic butterfly. The developers are aware of camera issues, but when it is a constant nuisance, joy suffers a painfully low ceiling. Motion sickness aside, the difficulty of controlling the angle during the most crucial times is more difficult than exploring certain parts of the worlds, which is harder than the side-quests and challenges you'll encounter. By side-quest, I mean doing some task such as finding certain people or solving some small puzzle. By a challenge, I mean something which you have to accept and try, and failing to complete the task requires that you reattempt completing the objective. There is no indication, here or when attempting some side-quest, regarding whether or not you're able to complete the task given your current progress and unlocked abilities; you may very well be wasting hours on something you can't presently complete anyway. On occasion, when exploring the hub for the next “tome,” you run into this problem where you’re just aimlessly searching, with no clear indication of what you're missing. Perhaps the most fertile solution is to simply revisit all the places you've already visited in case you've missed something vital. As you explore, you collect quills and pages. No, wait, they're called “pagies,” and sometimes you’ll find them locked in “cagies” – nostalgia is one thing, this choice comes across as almost overly patronizing. This, combined with virtually no difficulty, really makes me struggle to see exactly for whom Yooka-Laylee is aimed – aside from Banjo fans who'd buy this anyway. The pages are the currency, and there are over one-hundred pages to find. They unlock grand tomes or expand current ones, and these tomes act as portals other worlds to explore. Some ways to obtain these pages involve exploring the worlds, or talking to various creatures and assisting them in minor side-quests. Completing one of these took just seconds, but the hint they give you regarding how to complete these can be cryptic at times (or you may yet have the right ability for the job). Other collectibles litter the worlds, such as “ghost writers,” who are ghostly and fit in with the overall theme of the tomes and their pages. This leitmotif might not keep a player hooked outright, but at least there is a recurring idea here, and not just a disparate collection of items to track down. 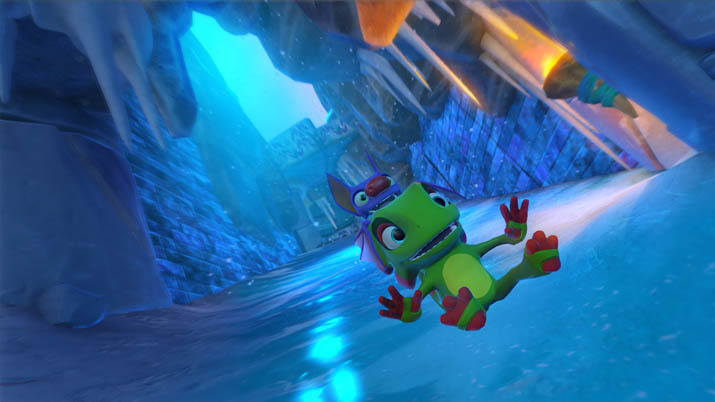 Worlds in Yooka-Laylee are far smaller than what one might expect from a platformer. Even after expanding a world, its size seems just over double that of one of those in Captain Toad: Treasure Tracker, for example. You have freedom to explore, but the worlds are minute (Tribalstacks Tropics, especially) in comparison. They are packed with content, especially once you unlock certain abilities. I was dismayed when I reached the ice world: you pretty much have to try to fall off the map to fail, thereby making is far easier compared to the first world. I thought the difficulty was supposed to scale upwards the more you advanced. Take away the various items in a world here and you'll be able to see the other side of the map, or just stand atop some high cliff and turn 360 degrees. Later worlds, however, such as the ‘Casino’ level, look a decent size and are more delightful than the first two. You use quills for unlocking moves which prove useful in certain side-quests and are needed to complete challenges, both of which grant pages and which vary in difficulty. You'll also unlock tonics, which you may equip (but only one at a time) after you meet a certain condition, such as stunning thirty enemies. The benefits of these vary: one increases your max health by one. One ability you may obtain from quills (roll) is just frustratingly difficult to control with any semblance of precision. Quick maneuvers are typically not required while utilizing this, save for a certain part. Without giving too much away, this one particular boss fight could be described as a Sisyphean task. Turns out, you are permitted to skip the bosses here until later (until you have better abilities ). This mechanic strips a great deal of what made platformers so challenging: forcing you to beat an unrelenting boss to progress to the next world. One’s way through a platformer is earned, not given. If difficulty is what you're wanting, then you may opt for Rayman or Rayman Legends instead – at least there's a clear indication of where to go and what to do. Your frustration may center on that which it properly should: it’s not that the platforming aspect is difficult, rather that you may be trying to access some place which you're not meant to access until later, so you're running around aimlessly. I've spent hours on a single point in Rayman, and gladly did so, whereas, a few tries at some of the sections found here, and I'm willing to move on to something else. Point being: make it difficult; pay homage to the platforming genre. Don't make it a complete pushover. Yooka-Laylee reminds me of classics such as the Spyro series, and TY The Tasmanian Tiger. One challenge, where you ride a mine cart, felt taken straight from Spyro, yet incredibly easier. I recall the challenge in Spyro requiring far more dexterity, skill, and precise control. Hit one thing, and you were done, you'd have to start over. Here? I rammed through a bunch of crates, set myself on fire multiple times, and won nonetheless (you can fall off the track, however). I don't care so much that Spyro had a very similar challenge; mine carts have been around since at least the early 90s, with Donkey Kong Country, and probably earlier still. It's hard to introduce something truly novel, and mine cart challenges are fun, so I was glad to see them here. In Hivory Towers, a not entirely hidden room will lead you to a trivia-based challenge. You have to answer ten questions correctly and have three lives to do so. This wouldn't be so bad, if some of the questions weren't "What was the first ghost writer you caught? ", or "How long have you been playing?" or "What was the first enemy you defeated?" No, I don't recall what enemy I first killed – whoever one I came across first after being able to tail-whip would be that unlucky sap. Nor do I know the enemies by their name alone; nor do I see a picture of the enemies to assist me during the question. Good luck to any player who's played this title for a few hours, puts it down for a week or more, then returns to it and attempts this trivia challenge. 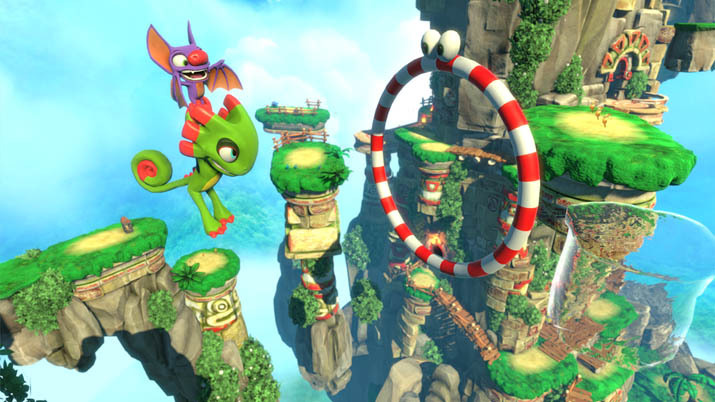 Most of the other questions are fairly straightforward, as long as you pay close attention to information in Yooka, your surroundings, and landmarks. It wouldn’t even be all that terrible, if it weren't for the fact that you cannot skip any of the chatter between questions. There were enough times elsewhere that disallowed you from skipping dialogue. I've played modern JRPGs where you are permitted to fast-forward through the dialogue altogether (really helpful if you already know the story or just want to get to the action), and other modern titles that incorporate trivia where there usually isn't any dialogue whatsoever to unnecessarily prolong this section. This – along with other issues I've brought up – just makes the implementation of various aspects of the release seem antiquated. Don't get me wrong, a side-scroller with 8-bit, pixelated graphics released this year can be good if it is executed well, and doesn't try to be exactly like the genre was decades ago. 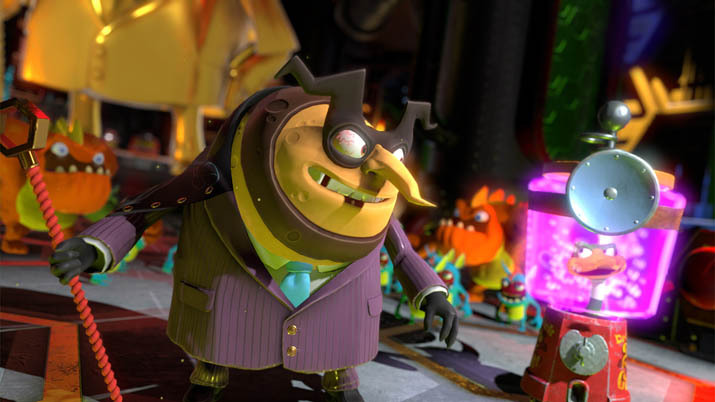 Yooka-Laylee isn't a horrible game, nor is it a great one. Camera control and other issues aside, Yooka-Laylee is a decent title per se, but it’s bland, and its various issues heavily overshadow many of the fun aspects. Some of the most fun I had, besides collecting pages (the act of picking up the page, to be specific), came from playing Rextro’s arcades and jumping blindly from incredible heights to see if I could stick the landing. The side-quests and challenges you'll find in subsequent worlds are more or less replications of what you found in previous worlds. Perhaps the greatest difference between worlds is setting: you're in the tropics for the first, then in a tundra region the next. The problem is that exploration and platformer classics, such as the Spyro series (PS1) or TY the Tasmanian Tiger (PS2), along with any Nintendo platformer – really any of the Mario, Yoshi, or Kirby entries which fit this description – already exist. Spyro and Rayman are classics which I’d gladly play, even in today's age. More than once I've said to myself: this is but a watered-down version of a cross between a Spyro entry and TY the Tasmanian Tiger. Had more attention and care gone into gameplay and combat – had this title risen to more than mere fan service – it could have been great. There was such a push to bring back the 1990s era of platforming, that that's pretty much exactly what resulted: a 1990s platformer, but with some updated graphics. IGN calls it “basically Banjo-Kazooie 3” , while Let’s Play Video Games  laments: "Oh, Yooka Laylee, you're trying so hard to be Banjo-Kazooie. I know you think that's what I want. I thought that's what I wanted, as a Banjo Kazooie fan. I'm sorry, but your desire to be your predecessor has made you really uninteresting. I wanted to love you, but I just couldn't." Ultimately, nostalgia has never been, nor will ever be, the reason behind a purchase of mine; nor should it ever overshadow gameplay and mechanics so much that care about how the release plays falls by the wayside. It definitely brings the 1990s era to the modern day, but some things just should be left in the past.